You might be surprised by some of the tools used in your eye test. Some optician’s equipment does such a good job it has remained unchanged for more than a hundred years – the ophthalmoscope has been in use for 150 years. But new technologies are helping us spot conditions earlier than ever before. OCT – Optical Coherence Tomography – is just one example of a groundbreaking imaging technology that is advancing the precision and quality of eye examinations. With many sight-threatening conditions, time is of the essence. The sooner you take action, the more effective your treatment will be. That’s why Leightons offers OCT as part of our Ultimate Eye Examination test. OCT lets us take images of the tissue behind the eye and a cross-section of many layers of the retina, not just the surface. It’s a little like an ultrasound for your eyes, and produces 3D high-definition scans. Why should I have an OCT eye examination? 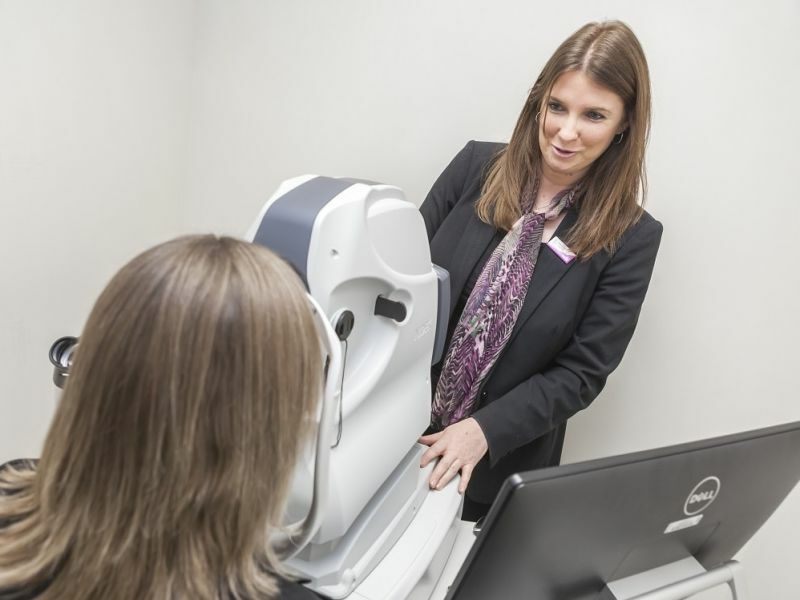 Having an OCT eye examination as part of your usual eye testing means we can spot issues sooner, detecting any changes to your eyes up to 5 years earlier than other methods, and long before you may notice any issues yourself. It can highlight, or help us to detect early signs of common eye problems such as glaucoma, diabetes and age-related macular degeneration. Our 3D high definition images let us see more of your eyes than ever before, and all your scans are stored as part of your records. So when you come in for your next appointment we can compare the images and accurately track any changes in your eye health. All this information lets us build a complete picture of your eyes, so that we can detect, track and treat eye conditions more effectively than ever. What will happen at my OCT eye test? An OCT machine takes scans of your eyes without touching them. The process is non-invasive and painless, and our expert Leightons optometrists are always on hand to answer any questions. OCT is included as part of our Leightons Ultimate Eye Examination, which costs just £69 and provides a full review of your eye health and vision. If you’re eligible for an NHS sight test, an OCT screening can be carried out in addition to your standard free eye test for as little as £40. How do I book an OCT test? You can book your OCT eye examination test by calling 0800 40 20 20, making an appointment online, or visiting your local Leightons branch.